Rest assured that when I write that the My Little Pony RPG is a reality, it is not a sign of the impending apocalypse. Mostly because what we actually have is Tails of Equestria – The Storytelling Game, a light, family-friendly RPG that is based upon My Little Pony: Friendship is Magic, the cartoon in which anthropomorphic ponies with bright, pastel coloured bodies, manes, and ‘cutie’ marks have adventures in the magical land of Equestria and learn all about friendship. Originally, both the cartoon and My Little Pony were aimed at young girls, but in more recent years it has been adopted by an older audience, including boys and men who are known as ‘bronies’. It should be made clear that primary reason that Tails of Equestria – The Storytelling Game is not the My Little Pony RPG is because players do not take on the roles of the characters from the cartoon—Twilight Sparkle, Rainbow Dash, Fluttershy, Pinkie Pie, Applejack, Rarity, Spike the Dragon, Princess Celestia, Princess Luna, and so on—but rather create a pony and then take them on magical adventures of their own and learn about friendship through the roleplaying rather than through just watching the cartoon. 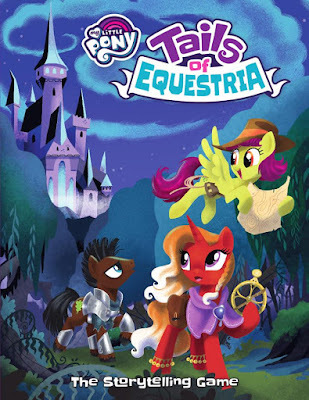 Published by River Horse Games, Tails of Equestria – The Storytelling Game is a Class and Level game which uses simple mechanics and the full set of polyhedral dice. It comes as a very bright and very breezy hardback that is written in a light and easy style such that an experienced roleplayer can read through it in a couple of hours or so and be ready to run the adventure included in the book, ‘The Pet Predicament’, with ease. So what can you play in the Tails of Equestria – The Storytelling Game? Ponies of course, but the choices are Earth Ponies, best known for their Stout Hearts; Unicorns, best known for their horn which grants them Telekinesis; and Pegasi, who with their wings can Fly. The fourth type of Pony, the Alicorn, is not available to play, but might be something that a Pony can aspire to become. Each Pony is aligned with one of the six Elements of Harmony, “…the most powerful magic known to ponydom.” These are Honesty, Laughter, Generosity, Loyalty, Kindness, and Magic. This alignment has no particular in-game effect, but rather it reflects a dominant aspect of a Pony’s personality. Each Pony has three Traits—Body, Mind, and Charm—and each Trait is rated by a die type, typically a four or six-sided die at game’s start. Similarly, each Pony will have one or two Talents, one related to the type of Pony he is and one related to his Cutie Mark that he is very good at. So this includes the Stout Heart, Telekinesis, and Fly Talents of the Earth Ponies, Unicorns, and Pegasi, as well as Creative Flair, Healing Touch, Pony Sense, Speak with Animals, and so on. Such Talents are also rated by die types, typically a six-sided die at First Level. As a Pony gains new Levels, he can increase the die for the Traits and Talents he has or choose a new Talent. Every Pony has a Quirk like Bossy or Too Silly. Pony creation is very quick and easy. Mechanically, Tails of Equestria – The Storytelling Game continues this simplicity. To undertake a task, a Pony rolls the die type associated with a Trait, aiming to beat a Difficulty set by the GM. So a very easy task has a Difficulty of two, a Quite Easy task a difficulty of four, and so on, all the way up to ‘Has anyone ever done this?’ with a Difficulty of anywhere between thirteen and twenty. A roll of a one is always bad news, whilst rolling double or more the Difficulty of a task is counted as an Amazing Success! Further, if a Pony has a Talent appropriate to the Task, he gains an extra die to roll or the Trait die is upgraded to the next die type depending upon the Talent. Similarly, a Pony can gain extra dice for a task if other Ponies help him and working together like this might even lower the Difficulty of the task. However many dice are rolled, the highest result rolled determines the success or failure of a task. A Pony always has a chance at succeeding at an impossible task because of a technique called the ‘Exploding Hoof!’. This is a variant of the exploding die mechanic found in other RPGs. In the Tails of Equestria – The Storytelling Game, when the maximum on a die is rolled, then a Pony gets to roll the next highest die, and if he rolls the maximum on that die, then he gets to roll the next highest die, and so on. Only the single highest die is kept—the dice are not added together. So for example, Pook the Pony has an important editing task to undertake which the GM sets at a Difficulty of Very hard, which is seven. Of course Pook the Pony will use his Mind Trait and because the editing involves something historical, the GM allows him to use his Keen Knowledge (History) Talent, which gives him another die. So Pook the Pony’s player has two six-sided dice to roll, but the Difficulty is still seven, so he is going to rely on the ‘Exploding Hoof!’ technique in order to succeed. Pook the Pony’s player rolls both dice, getting a result of one and six. This is good news because it enables Pook the Pony to use the ‘Exploding Hoof!’ technique, which in this case means that his player can roll an eight-sided die. This he does and not only does Pook the Pony’s player succeed, he rolls an eight and activates the ‘Exploding Hoof!’ technique a second time. This allows the player to roll a ten-sided die, but this time he rolls only a one. This means that the result of the eight-sided die, an eight, is the best result and this is what the player keeps and means that Pook the Pony succeeds and manages to successfully edit the document. Of course a big factor in My Little Pony: Friendship is Magic is the importance of friendship and so it needs to be a major factor in Tails of Equestria – The Storytelling Game. One way in which the game addresses this is with the possible lowering of the Difficulty of a task when Ponies work together to complete or overcome a task. The other way is through the use of Tokens of Friendship. Every Pony begins with a number of these equal to the number of players round the table, including the GM. These can be spent to reroll a die, reroll a die, but use a twenty-sided die instead, or to automatically succeed. This costs one, two, or three Tokens of Friendship respectively. If the GM allows it, they can also be spent to change minor aspects of the story. This though, is just the effect of one Pony using his Tokens of Friendship. If two or more Ponies mix their Tokens of Friendship, then the effect of these Tokens of Friendship can be increased. For example, two Ponies might expend a Token of Friendship each and the GM could rule that instead of this allowing a task to be rerolled using a twenty-sided die, which costs Tokens of Friendship, the Ponies automatically succeed at the task, which normally costs three. Presumably, this increased effect applies to possible changes made to the story, but this is not developed. The downside to using Tokens of Friendship is that once used, they are gone and cannot be used again. The primary way of a regaining Tokens of Friendship is to gain a new Level which typically happens at the successful completion of an adventure. Ponies can also acquire new Tokens of Friendship when another Pony and his player joins the group, but the primary in-game method of regaining them is through roleplaying great acts of friendship. It is up to the GM to decide what such acts are. Once the GM is ready and the players have created their Ponies, Tails of Equestria – The Storytelling Game includes a lengthy scenario, ‘The Pet Predicament’, which takes up a fifth of the book. In this the Ponies are visiting Ponyville when they rescue a pet belonging to one of the characters from the cartoon, Fluttershy. This leads to the Ponies being asked to pet-sit not only Fluttershy’s pet, but also to look after all of those belonging to the Mane Six from the cartoon series, as they go to investigate a threat to Equestria. Of course this does not go as well as expected and the Ponies need to make every effort together to locate and rescue these pets when they escape. Their efforts will be hampered by the personalities and abilities of the pets, but everything should work out in the end. The scenario could have been slightly better structured to make it easier to run, but it should last one or two sessions of play. Tails of Equestria – The Storytelling Game ends with the stats for not only the characters and animals involved in ‘The Pet Predicament’, but also the members of the Mane Six and other characters from My Little Pony: Friendship is Magic. The book also includes a good index and a set of die charts. There is one for each die type and allows the game to be played if a group lacks polyhedral dice, by having the players close their eyes and then point at a number on the chart. It is a solution, but it is a somewhat clumsy one. The roleplaying game includes advice for players on creating their Ponies and for playing Tails of Equestria – The Storytelling Game. There is also advice for the GM on how to run game. All three sections of advice are in the same chapter and in each case the advice is good enough. Yet there is an issue with Tails of Equestria – The Storytelling Game and that is that the authors are not quite sure who the target audience is for the game—or if they are sure, it certainly is not clear in the book itself. Is it for the original audience for My Little Pony, that is, young girls? Is it for traditional roleplayers? Is it for bronies? The subject matter and background material will probably not interest the majority of traditional roleplayers, so not them. This does not mean that experienced roleplayers could not play Tails of Equestria – The Storytelling Game and enjoy it. That said, there is a box of advice aimed at older readers (or roleplayers) about running Tails of Equestria – The Storytelling Game for a younger audience. Again, the experienced roleplayer will have no difficulty running Tails of Equestria – The Storytelling Game for a younger audience. For the inexperienced roleplayer or anyone new to roleplaying, it is another matter—and that no matter if the prospective GM is an adult, a young fan of My Little Pony: Friendship is Magic, or a Brony. In other words, they all need to have roleplayed before if they are to get the most out of Tails of Equestria – The Storytelling Game, because as much the game uses simple rules, it is not as good an introductory game as it could be. One problem is that the use of polyhedral dice could be confusing to an audience being more used to dice being ‘square’. The charts help somewhat, but they are cumbersome. Another problem is that as an introductory roleplaying game, what it really lacks to that end, is a thoroughly good example of play that would illustrate how both the game and roleplaying works. Had that been included, as well as a guide to rolling the funny shaped dice, Tails of Equestria – The Storytelling Game would be a much stronger introductory roleplaying game. Certainly a further challenging issue for the inexperienced GM is handling Tokens of Friendship when the players decide to mix them up. This could have been given much more attention, especially when it comes to altering the story. The experienced GM will probably be able to find advice elsewhere or know how to handle such situations, but not the inexperienced GM. Physically, Tails of Equestria – The Storytelling Game is big, bold, bright, and breezy. It is illustrated with lots images from My Little Pony: Friendship is Magic and once you get past compound words such as ‘anypony’ and ‘somepony’, the book is also well written. Where Tails of Equestria – The Storytelling Game really comes into its own is as game for the traditional roleplayer to run for younger players. The rules are simple and very easy to pick up and within an hour or two of picking up the book to read, an experienced GM will be ready to run the scenario in the book. The player new to being a GM might want to play Tails of Equestria – The Storytelling Game first with another GM to learn the rules before running it himself, but again, the rules are simple and easy to learn, such that they would not impede initial refereeing efforts. Not the perfect introductory roleplaying game that it could have been, Tails of Equestria – The Storytelling Game is nevertheless, a nice, familiar way to many with which to introduce certain audiences to the hobby.